Since the start of 2017, TecAlliance has presented itself as a company offering training at many training and recruitment fairs, including those in Lauda, Mosbach, Röttingen, Würzburg, Rothenburg ob der Tauber and Schrozberg, all in Germany. TecAlliance once again opened its doors to interested schoolgirls from Year 5 and above during the Girls’ Day on 27 April 2017. The appearances at the training fairs and the Girls’ Day were planned and implemented independently by the current TecAlliance trainees. They organised the setting up and taking down of the stand. 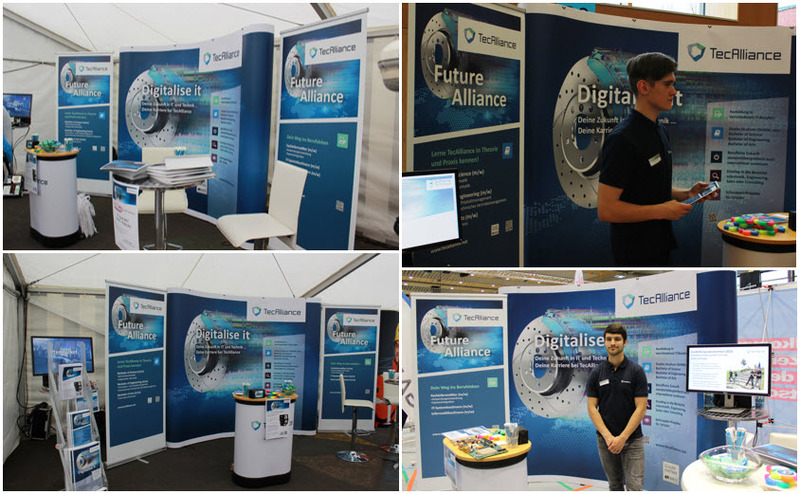 They were also on site at the training fair stand to present the company and to win new trainees for TecAlliance. During Girls’ Day, where girls could participate at all three TecAlliance locations in Germany (Ismaning, Cologne and Weikersheim) for the first time, TecAlliance wanted to get schoolgirls enthusiastic about information technology. The programme for the participants included the basics of the programming language C#, the basics of data types and loops, the communication of basic hardware knowledge, the basics of the .NET Framework and learning about databases. The Girls’ Day was a great success again this year. The next Girls’ Day will take place on 26 April 2018. Further information on training professions and available training places is available on the TecAlliance website, from which it is also possible to download the training brochure.